Have you ever seen the optical illusion that looks both like an old hag and a young woman, depending on how you approach it? That’s how I feel about Parfums MDCI Péché Cardinal. Not that it has anything of the old hag. Not at all. But come at it one way, and it’s nothing but caramelized peach. Look at it through a different lens, and you get tuberose. Peach. Tuberose. Peach. Tuberose. It’s kind of marvelous. Perfumer Amandine Marie developed Péché Cardinal, released in 2009. It has notes of peach, blackberry, black currant, davana, coconut, lily, tuberose, plum, sandalwood, cedar and musk. When I fist smelled Péché Cardinal, I decided I was smelling a peachy floral. After that, peach is what I got whenever I sniffed Péché Cardinal. It was a plush, fragrant, earthy peach, but among the riches of my Parfums MDCI sample set, it fell to the back. During a post about perfumes that smell like Champagne a few weeks ago, a commenter mentioned wearing Péché Cardinal for New Year’s Eve. She inspired me to pull out my sample and dab it on. I ended up wearing it four days straight. When I decided to review Péché Cardinal, I looked up its list of notes, saw "tuberose," and sniffed it again. Suddenly, tuberose popped up in the front row. Wait. Was Péché Cardinal maybe a tuberose fragrance after all? I’d always thought of tuberose as fruity, although perfumers often seem to play up its gaseous, leathery, or green notes. But I’d never thought of peach as particularly tuberose-like. Maybe what I smelling in Péché Cardinal was tuberose and not peach at all. It was perplexing — in a good way. Péché Cardinal kicks off with ripe, but not overly sweet, peach (or tuberose). Seeing blackberry and black currant on a list of its notes draws it to my attention, but otherwise I’d think I was smelling a lush peach that didn’t cleave to the ultra-sweet “peach” that infests supermarket candles and car air fresheners, but rather was a true peach with hints of the garden about it. Either that, or I was smelling a fruity, welcoming, non-diva tuberose. A thread of clean musk runs through Péché Cardinal, lightening it and moving the composition away from smelling like dessert but not so far as to waft shampoo. After an hour or so, what smells like benzoin — warm and chewy and a nice complement to the peach and tuberose — settles in, cushioned by wood. My only quibble with Péché Cardinal is the bit of sharp woody musk that creeps in toward the end of its life on skin. It’s not the cedar and clean musk I smell earlier, but the woody musk that was so popular for a while in nouveau chypres like Miss Dior Chérie (now called Miss Dior) and Lanvin Rumeur. On a one-to-ten sillage scale with Christian Dior Poison a ten, Péché Cardinal weighs in at about a seven. It lasts a full eight hours on my skin, and a brisk bicycle commute home reawakens its tuberose. I’ll use every drop of my Péché Cardinal sample and relish it. And I’ll never drink a Bellini without smelling phantom tuberoses, or sniff a tuberose without seeing a peach, all gold and red, oxidizing in the fruit bowl. Parfums MDCI Péché Cardinal costs $250 for 60 ml, and $275 and $700 for the resin bust and bisque bust-topped 60-ml bottles, respectively. For information on where to buy it, see Parfums MDCI under Perfume Houses. Haven’t tried Peche Cardinal but I know that my friend, Ladymurasaki who likes to drop by NST is enjoying this perfume a lot. I got a sample of Chypre Palatin, will finally try some MDCI. Chypre Palatin is wonderful–but sure to give it a few days of wear to appreciate all its beauty! I had only a tiny sample, too. To be frugal with it, I only wore it dabbed on the base of my thumb. Someday I’ll have enough to spray all over! The duck and the rabbit? How many of these MDCI perfumes are good? You make this one sound mmmm, Angela, and that Chypre Palatin was well-reviewed too. I hadn’t even considered this line b/c the bottles have little portrait busts on them and I’ve learned to stay away from such things. Now I’m confused. If I knew that at least four of these bad boys were actually very good, I might spring for samples. It’s probably my favorite, too, of the MDCIs. The sample set is a great deal. I haven’t tried them all, but Enlevement au serail, Promesse de l’aube, and Invasion Barbare are wonderful, too. I’ve been hesitant to try these, but maybe I could consider some samples. . . where do you get them? You can probably get small samples from the usual suspects, but Parfums MDCI–check their website–offers a box of five 10-ml samples for 90 euros, which includes postage. If you buy a full bottle through the website afterward, they’ll deduct the cost of the sample set from it. Almost all MDCI are good quality scents. Enlèvement au Sérail, Un Coeur en Mai and Peche Cardinal are my top 5. I forgot about Un Coeur en Mai! I am testing Chypre Palatin right now and this fragrance has serious class. It’s a fascinating perfume to me. Thank you for all the enabling. I’ll definitely give these a try now. Tania Sanchez references that optical illusion in her review of Reverie au Jardin (she says the fragrance has two faces, one smiling, one grimacing … and clearly I have read the Guide too many times). Another very peachy tuberose: the original Carolina Herrera. I’ll have to go back and read that review! Thanks for the referral to another peachy tuberose, too. The duality of this perfume is so much fun to me. I can wear it when I want floral with fruit accents or fruit with floral accents, and the blackberry note comes out rather strongly on my skin as well. It has been on my to buy list for a couple years and is so sunny and happy that I can’t help being in a good mood as soon as a few drops hit my skin. Love this one! Anything that brings up a person’s mood is a must-have! I wish it weren’t quite so expensive, but at least the quality shows. Though the too-muchness of Péché Cardinal makes me smile — more Bollywood than Hollywood — I admit this is one scent I ran away from screaming when it was presented. It was a pretty sharp turn from Enlèvement au Sérail and Promesse de l’Aube, two MDCI by Francis Kurkdjian that felt properly old-school and lush. The peach is pretty much one of the facets of tuberose, amped waaay up; the blackcurrant bud note is used to elicit the slightly raspy green peachskin effect, and give it a more natural feel. It’s a great combo, but that peach was the size of Manhattan and fluorescent on me! Yes, it’s a big, juicy fragrance! But then, tuberose is big, too, but with a whole different mood about it. I love the Bollywood comparison. I’m wearing Promesse de l’Aube right now–tender and lovely. Getting out the sample box inspired me to try them again. I’m trying to remember if I tested this one during my visit to Roja Dove this summer. I definitely tried Enlevement au Serail and Promesse de l’Aube but I know that there were a couple of others too. *sigh* It’s one of those brands that I’m wary of properly exploring because their perfumery style seems to be right my alley and their prices are…well…yeah. How terrific that you got to go to Roja Dove. I’m envious. I really want to try this one. I’ve tried Chypre Palatin and Enlevement au Serail, and both were beautiful, so I have high hopes for this one too. It’s distinctly different from either of those you’ve tried, but it’s a fun one to sniff–easy and glamorous. This was actually the first MDCI I tried. By chance. I went into a perfume shop and wanted some information about Goutal. Apparently this one had just arrived and the owner said she loved it. I remember really liking it. I have a small decant of Invasion Barbare which I adore and tried both Enlèvement, Promesse and Chypre this summer in Paris. The second one was a huge coup de foudre. I have been meaning to get their sample set for ages but can’t make up my mind which perfumes to get. Yes the line is very expensive but one of these days I might just get a full bottle of one of them. Thank you for reviewing this! It’s probably the most lighthearted of all the MDCI’s. “Lighthearted” is a great word for it! Having a bottle of one of these would be terrific. The difficulty for me would be in choosing one. Unfortunately, this smells like cling peaches and corn tortillas on me. Perhaps I shouldn’t be wearing tuberoses anyway. I laughed out loud when I read “cling peaches and corn tortillas”! It definitely doesn’t sound like the right fragrance for you. I always got a bit of peach from Fracas, which I doubt will ever be unseated as my favorite tuberose composition. Tuberose is so difficult for me! I love it, yet it doesn’t love me back most of the time. Nevertheless, I do dab on Fracas from time to time. Thank you Angela for another great review. To me, Peche Cardinal is in the same vibe as Annick Goutal Quel Amour and Guerlain Nahema. They are fruity florals with sophistication and lots of characters, only Peche Cardinal is “peacher” and Nahema is “roser”, while Quel Amour is “cherrier”! I’m wearing Nahema today! It must be my week for intense fruity florals. I hope everyone is aware that Péché Cardinal means Cardinal Sin and that the word ‘péché’ has absolutely *nothing* to do with the French for peach, which is ‘pêche’. I’m puzzled as to why the creator chose to give a peach-based perfume a name containing a word that can so easily confuse non French speakers. I think that’s deliberate, a wordplay. It would be *if* the two words were pronounced the same, but they’re not. Not at all. Maybe just a wordplay for non-French speakers? At least they didn’t name it with the French word for “fish”! 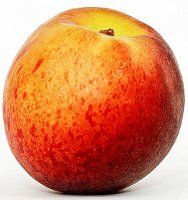 The same word ‘pêche’ (with a circumflex accent on the first ‘e’ and no accent on the final ‘e’) means both ‘fishing’ and ‘peach’. Neither is spelt or pronounced like the word for ‘sin’, ‘péché’ (with an acute accent on both ‘e’s) so there cannot be any confusion. If they *had* used the word ‘pêche’, only the context would have indicated the correct meaning. But this is not the case here. Thanks for all the explanation on the awkward word play! It does sound like a dessert, doesn’t it? Must be my wishful thinking. Bellini is a great way to describe this one. I love that peach top note. However, the woody musk killed it for me. Well, $$ saved–that’s for sure. I’m getting a small sample in a swap! Also, a swap buddy sent me a very generous decant of Chypre Palatin and that is one CLASSY scent. I had previously read about the sample program and could not decide which 5 to pick…but this review and the posts are such enablers I feel like I should check it out again! I “forgot” that the cost of the samples can go towards the purchase of a FB. I hope you enjoy it! I love Chypre Palatin, even though it isn’t 100% me. I’m counting on getting myself a decant at some point, too.